Is Cabinet Refacing the Solution to Your Kitchen Woes? 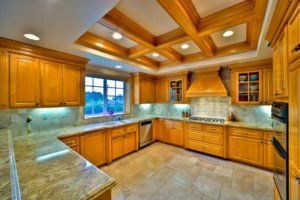 Home > Blog > Kitchen Remodeling > Is Cabinet Refacing the Solution to Your Kitchen Woes? Rustic or modern? Ornate or streamlined? What about subtle or dramatic? If are looking to create a new look for your kitchen, or are simply looking to give your cabinets a fresh look, the process of cabinet refacing may be right for you. Cabinet refacing is a method that allows the opportunity for homeowners to give a new lease of life to their kitchen with new doors, drawer fronts and matching veneer, while keeping the existing, original cabinet boxes. The best part: Without changing the layout of the kitchen, you can improve both the aesthetic look and overall durability of the room without the “new kitchen” price tag. Is Cabinet Refacing Right for My Kitchen? Many homeowners don’t realize that door and drawer fronts can wear down faster than the actual cabinet frames. Therefore, it’s not always necessary to install new custom cabinets. Refacing cabinets can give you the option of changing your kitchen’s overall look without having to gut out your kitchen (or bank account). Done properly, refacing can help you reach the results you want at a reasonable price. (Keep in mind: Some of this depends on the doors you select and which company you purchase them from). Is Refacing a Hassle and Time Consuming? Most cabinet refacing jobs are completed in two to four days. Typically, home remodeling services clean the kitchen’s work area each day, giving you full use of your cooking areas and plumbing each night. Instead of completely replacing your cabinets, when you choose refacing, you are doing more than you may realize, especially when it comes to the environment. You are not only keeping cabinet boxes out of a landfill, but you are also conserving the materials and energy it would have taken to build new ones. Contact Republic West Remodeling today for cabinet refacing and other home remodeling services in Phoenix. Call 480-481-9595 for your free consultation.